Q: I'm growing my beard out, and it itches like crazy. What's going on? So you want to claw your face off? That's completely normal. When you get to the "stubble" phase, your hair is stiff, and often pointed (think of a pin cushion). This will irritate your skin. Also, the hair is trapping oils and dirt. You may get ingrown hairs, bumps, black heads-- it's enough to make you want to reach for a razor. Don't do it. This is a short phase, and it will pass. Our Beard Saver will help. It has lime to break down the dirt and oils (less bumps and ingrown hairs!) and will soften the pins and needles feeling. Our Beard Wash will help keep your skin underneath clean, without drying it out. And your partner will appreciate the softer mug. Nobody likes "make out" rash. Q: I have a full beard, and it's out of control. How can I tame my mane? Beard hair is often coarser than the hair on your head. While you may just need to run a brush or comb through your hair, your beard needs a little bit of weight to keep the frizz to a minimum. Our Beard Saver has aloe, shea butter, and almond oil to condition and smooth. Remember, just a dab will do. Q: This is embarrassing...how do I get rid of beard odor? Embarrassing, maybe, but completely normal. Facial hair can trap oil, dirts, and even the smell of your favorite meal (Shrimp Scampi, anyone?). Washing your beard with regular soap or shampoo can help, but often doesn't fully neutralize the scent. Think of garlic or onion on your hands-- giving them a good scrubbing doesn't always take care of the odor. Citrus, like lemon and lime juice, neutralize strong odors (try Googling "lemon for garlic odor" to find out why). We use real lime essential oils in both the Beard Wash and Beard Saver. No artificial fragrances, just the real deal. Q: My skin is flaking underneath my beard, whats going on? You, my friend, are suffering from what we call "beardruff," and it's caused by your pores getting clogged and your skin drying out. But it can be solved! Attacking the problem by using our Beard Washes and Beard Savers will get the skin underneath hydrated and looking and feeling as good as your beard. 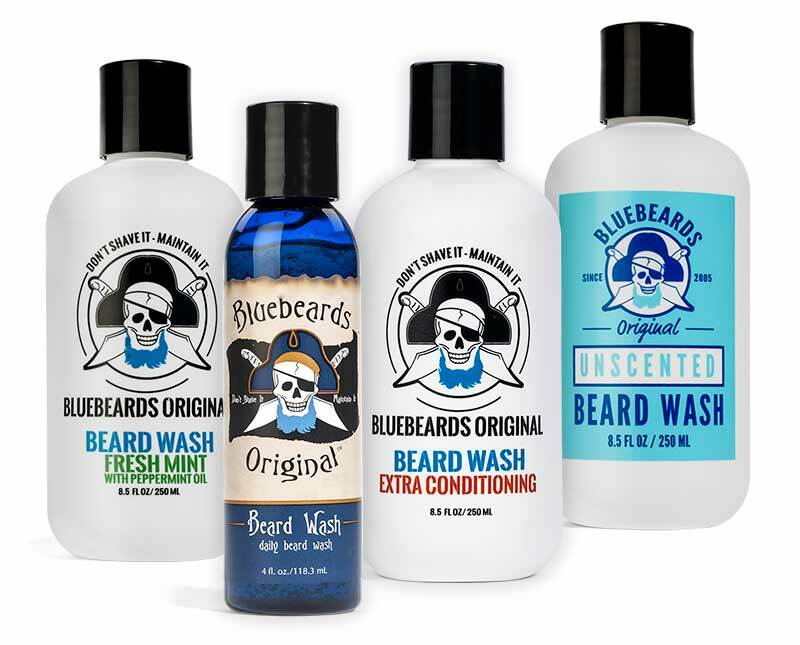 Q: Why Bluebeards Original vs just getting Beard Oil? We're called Original for a reason: we started this industry back in 2005, as the first company for beards, by beards. We focus on your skin and beard and pride ourselves on having been in the business more than a decade. There are a million beard oils but they won't treat the skin underneath. In fact, oil may harm your skin by clogging pores. Our products actually eliminate the need for beard oil. If it's a million fragrance options you want, you can get a nice cologne for that and save your face the trouble. Everything in our bottles is there for a reason.